The history of wool doesn't sound all that exciting, but underneath the layers of fluff there is story that is just as riveting as how Facebook or the iPhone came to be. Cabaret performer Kit Richards knows this and in her Melbourne International Comedy Festival show, Wool! A History of Australia's Wool Industry: The Musical, she presents the story of Elizabeth and John Macarthur, two wool pioneers from the late 1700s. Armed with just a few hats to bring these figures to life, and despite the comedy and cabaret elements of the show, she ensures that the portrayals of John and Elizabeth are not parodies or over the top but seen as authentic people with goals and motivations. While set in the late 1700s, Richards tells the story through a contemporary lens with a focus on Elizabeth's role during this time; she is not just a housewife but an active player in the wool industry and very much driven by her own desires. These desires and dreams are made clear in the songs that Richards performs as Elizabeth but also in the song she sings as other characters, providing a richer exploration to the experiences of these people. The music and the lyrics are fun, expressive and with great word play so it's no surprise this show was nominated for a 2019 Green Room Award for Outstanding Achievement in Writing for cabaret. 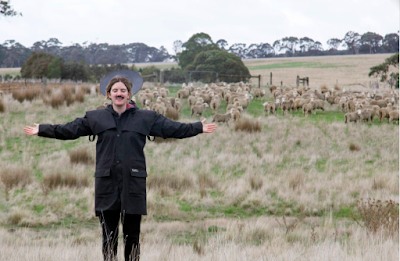 Richards often steps out of her wool industry narrative to add some side-commentary explaining why aspects of the show, such as why certain scenes were cut out and why certain directorial choices were made. She work these seamlessly into the show with the explanations providing the audience a greater sense of the overall story and subsequently allowing them to appreciate the production even more. If you're looking for a show that wears its heart on its woolly sleeve then look no further than Wool! A History of Australia's Wool Industry: The Musical. It may not be the most thrilling subject to base a show around but Richards performance results in a rewarding story and engaging original music. Richards informs us that the show is only 70% historically accurate and even if this is the case, I can confirm it is definitely 100% entertaining.